This kit went together smoothly and without a hitch. The construction quality was excellent, and the directions are complete and thorough. It worked the first time, and provides an interesting display. This device is rather small. At 4" across and 5" high (about 10cm wide and 13cm high) it does not require much table space. You may prefer (as I do) to leave off the front cover for easier viewing of the small globe, and to help illustrate how it works. I had no problems whatsoever during construction. My suggestions below are only of the most minor possible nature, and are related only to a few small details of appearance. PCB: The printed circuit board was of good double-sided material, with plated-through holes and pre-tinned connections. It has a nice green solder mask to prevent bridges, and a sharp clear stencil for labels. However, it would have been helpful to position the part value's label next to the component, rather than under it. Also, as a matter of personal preference, I would like to see all the parts oriented in a consistent direction, such as placing all resistors in an east/west manner and so forth. It was a clever idea to use the PCB itself as a structural element. Optoelectronics: It was a huge convenience to have the IR emitter and detector in the kit. This may actually be one of the biggest selling points of the kit. My experience with my published levitator design was that many people have difficulty locating and purchasing the correct component. LNS Technologies went to some length to ensure you don't accidentally exchange these two components. They look quite similar, so LNS put a helpful colored sleeve on each one to tell them apart. 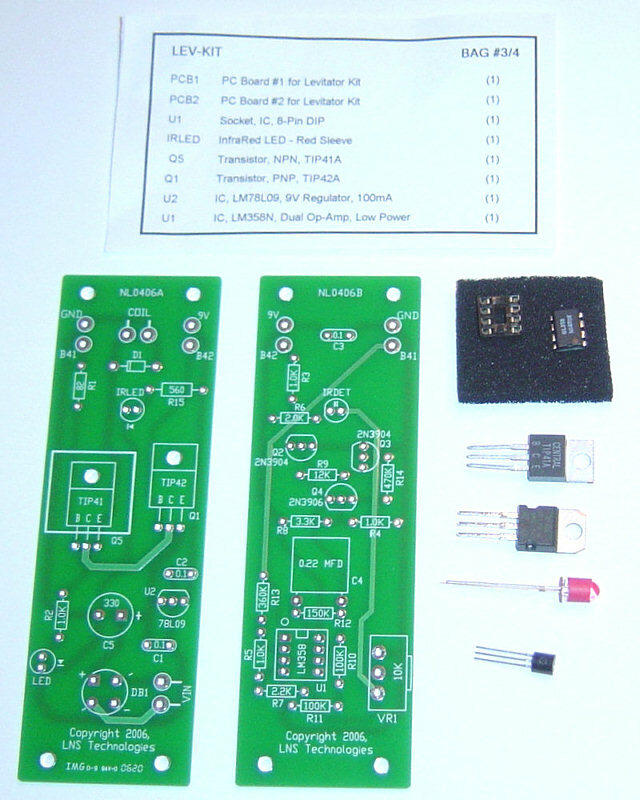 Power supply: This kit operates from a 12v DC 500mA wll-mounted power pack (included). 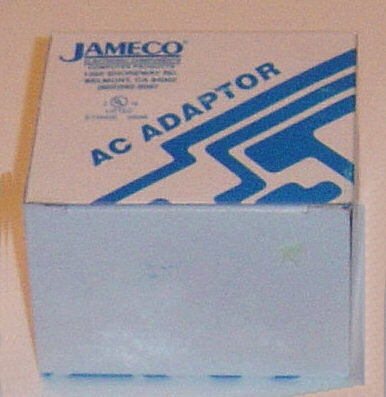 Although the small box has a huge "Jameco AC Adapter" label, this power pack is a DC device by design. The printed circuit board carries a full-wave rectifier to ensure that a reversed connection cannot damage any components. A filter capacitor is also included, because some power packs may have insufficient DC smoothing of their own. An LM78L09 voltage regulator provides regulated 9v power. This is a simple and effective power supply that runs cool and should last forever. However, I think it would have been convenient to provide a connector instead of permanently soldering the transformer wires to the PCB. Lifting coil: It was wonderful to have the complete and finished lifting coil included in the kit. Since I have built a few coils by hand myself, I appreciate having it provided in the kit. This is a huge time savings in construction, and ensures it works properly in the circuit. Flight: The circuit is smooth and stable, and I found it easy to launch the globe into suspension. 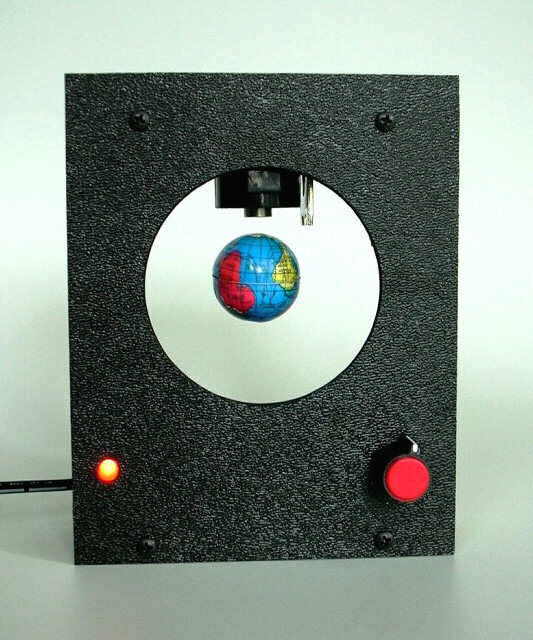 The device tolerates a reasonable amount of knocking about without dropping the globe. For example, you can pick up and gently move the levitator without interrupting the flight. Since this is not a large device, the flying height is only about a half inch (5mm) and the lifting weight is correspondingly small. When the power is turned off, the globe falls down. This is to be expected since there are no permanent magnets involved. However, I would really like to someday see an enterprising engineer plan for this in the design, and provide something to safely catch the ball so it doesn't break apart or roll off the table. Troubleshooting: The manual includes a troubleshooting section with a list of the usual inspection points. It reminds you to check for component polarity, solder bridges, parts placement and so forth. Now here is the truly wonderful feature -- if all else fails, you are invited to send your kit to their repair service with a nominal $10 fee for labor costs and shipping charges. I feel this is quite generous, and will guarantee successful operation. Conclusions: This is a small, inexpensive, easy-to-build kit with a very high probability of working successfully. I recommend it!